skip a planned fuel stop. It all worked out in the end, but it could have cost us the race. know if I'll have time to post any further updates until we get to La Paz. Baja Pits. While there, we met with Victor and his brother, Ivan, to review our race preparations. hold off until after we're done! Had the car inspected at SCORE tech. 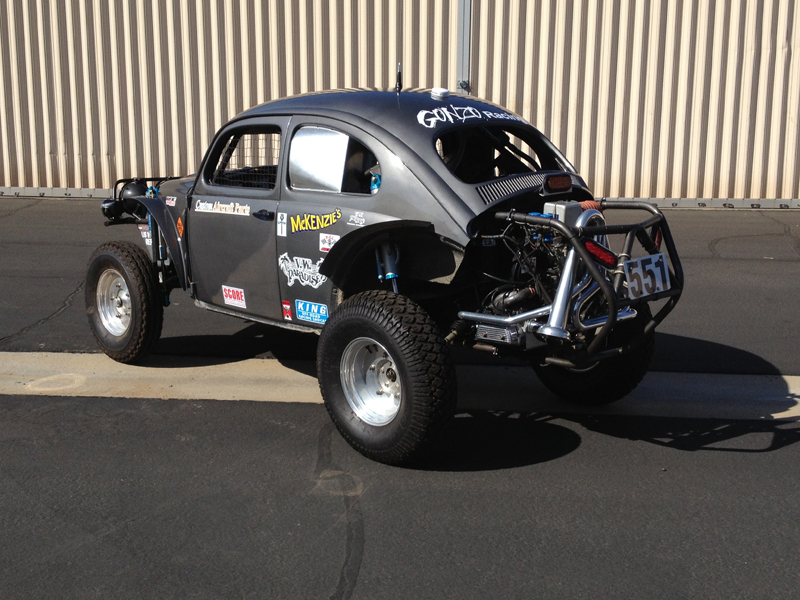 this morning, our post Baja 500 roll-over inspection. additions, etc.. Trevor and I remarked to each other last night that we're getting excited! side in time to catch the race car. They are a huge help to us by covering that area. it's just a waiting game! working. It's probably something simple, like a loose wire but it's another thing to chase down. If that's the worst of our problems though, we're in good shape. condition of the race course (at least when the photo was taken). the engine and transaxle were trouble free. Back in the desert where it belongs! session in next weekend, time is getting short for us to sort out any problems we may find with the car! 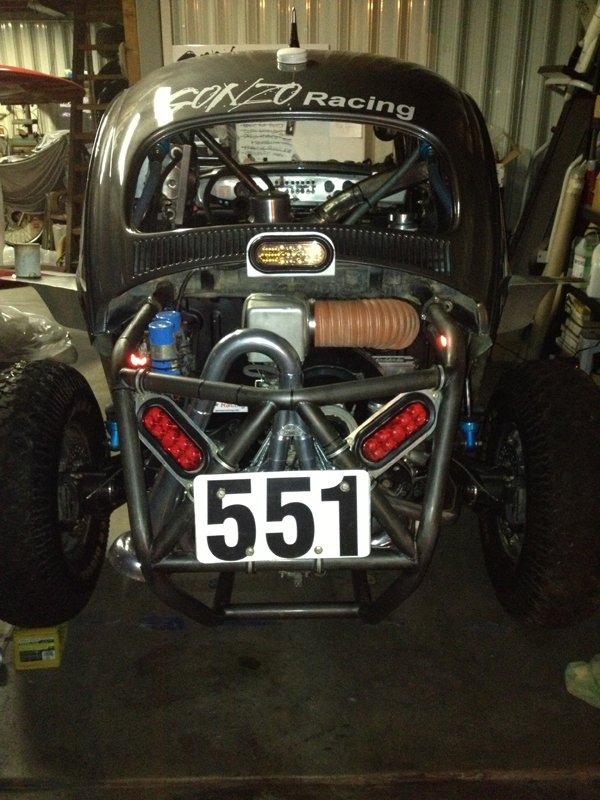 car is ready to go, we only need to apply our new numbers and add fuel. on Saturday though - stop by and say hi! Reassembled and ready to run! to fit the way we want. 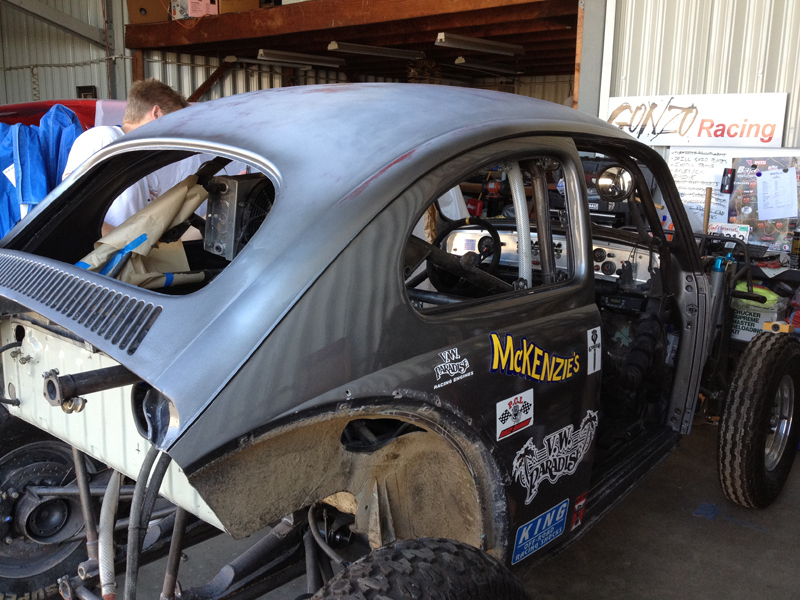 We will have the car on display at Fiber Tech's "Back to the Desert"
open house this Saturday in Santee. Hope to see you there! better "glamour" shots at the Fiber Tech open house this weekend. having it on display next weekend at the Fiber Tech "Back to the Desert"
and installation of our new CV's and axles, not my favorite part of the prep..
Just after shooting the roof. First time out in the sun! 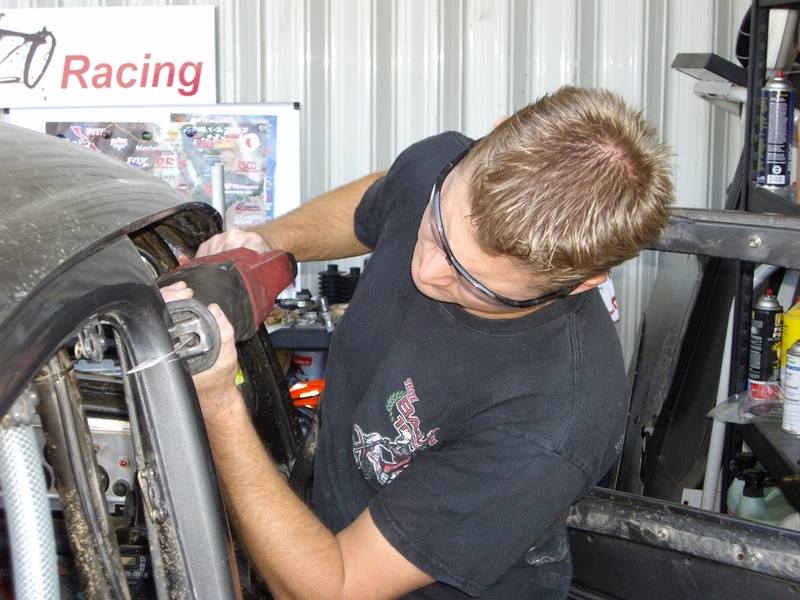 us to do it that way in our shop (that also minimizes the overspray "cloud"
rain gutters down to the body line. Those made for good "natural breaks"
my IOE trip the following week. Maybe a test/tune session in September? 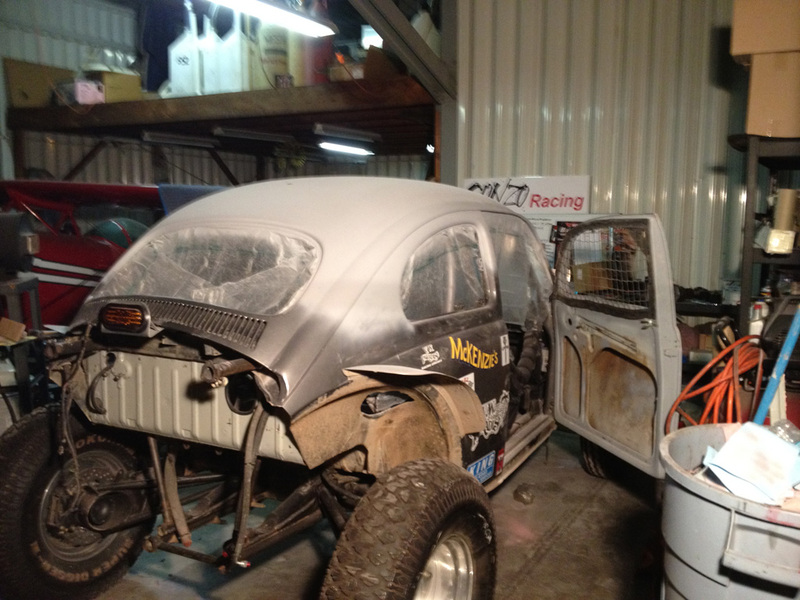 work and start prepping for the Baja 1000. The Driver's side pillar joint blended, in primer and ready to paint. Filling a few small dents on the new roof. 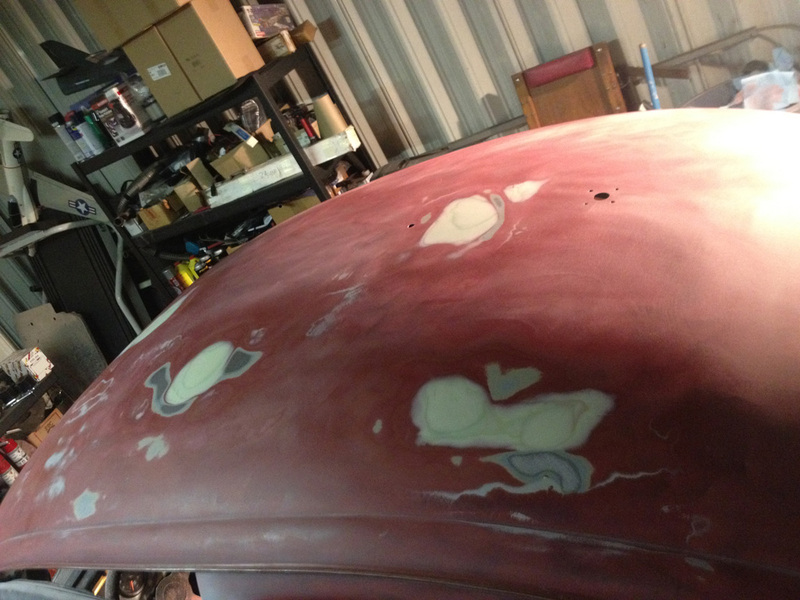 New roof "body worked" and primed. Now, we just need to wet sand and then paint. reason why he can't do that as well!). time to help him and he has it nearly complete! We have our engine and trans. I'll probably be there until the end of the month so Trevor is on his own again! Finally back on it's feet! mind off the Boeing 757/767 for a while. of work involved, but it's mostly just re-assembly from this point on. The old bumper looking pretty tired. Well, maybe the lights and number plate. 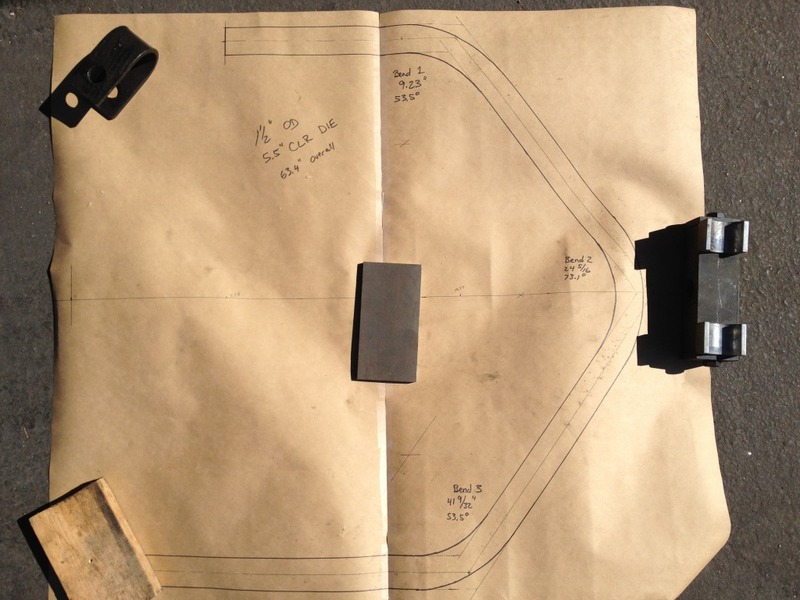 Full size bumper tube template to help get the bends correct. 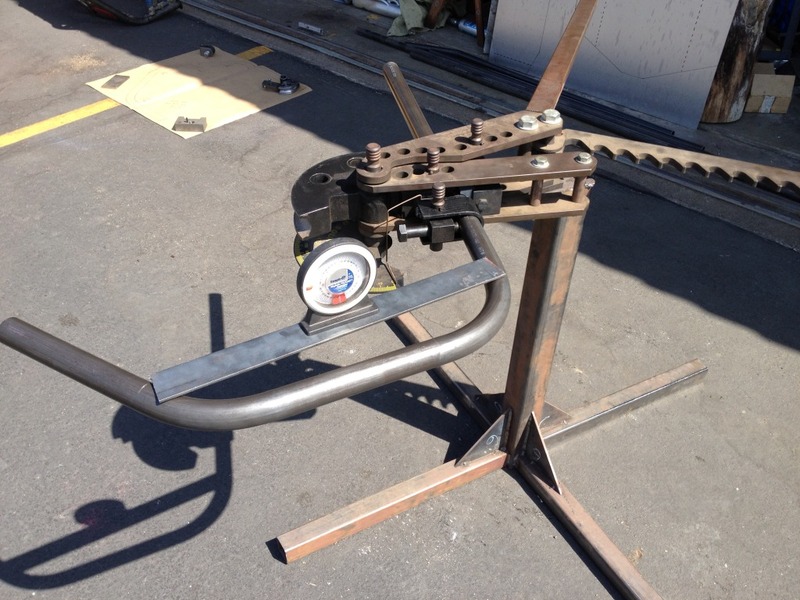 Bending the main tubes. 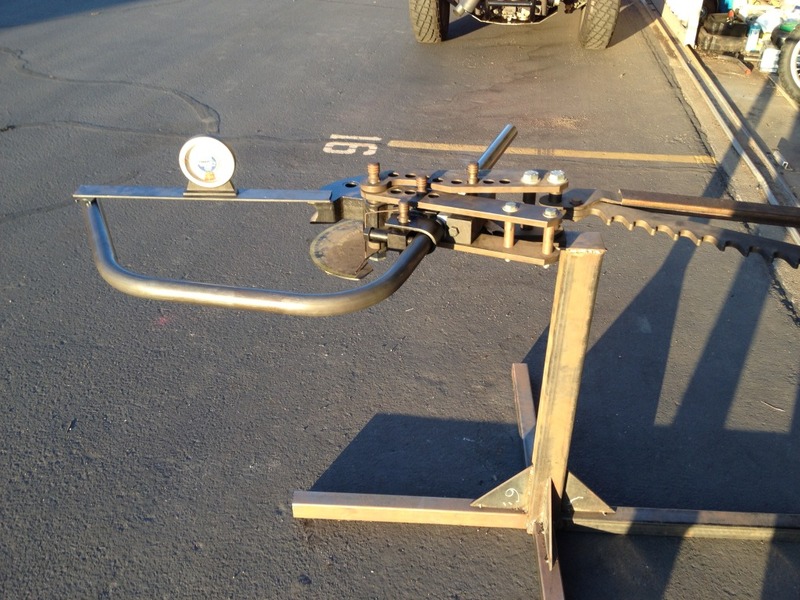 Our JD Model 3 bender works great. It requires a little muscle but it does everything we need. This one looks just a little "over-bent". Main hoops bolted up awaiting cross-tubes. 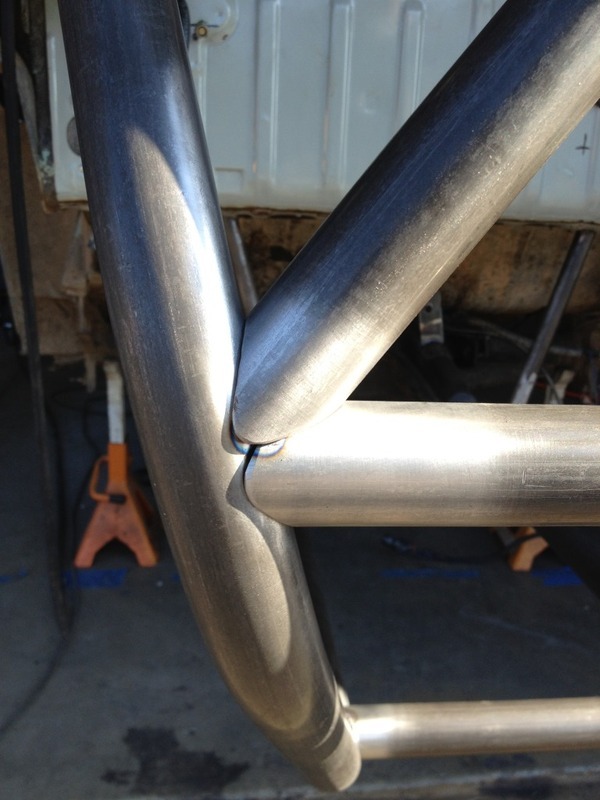 tube notching tool would be nice! 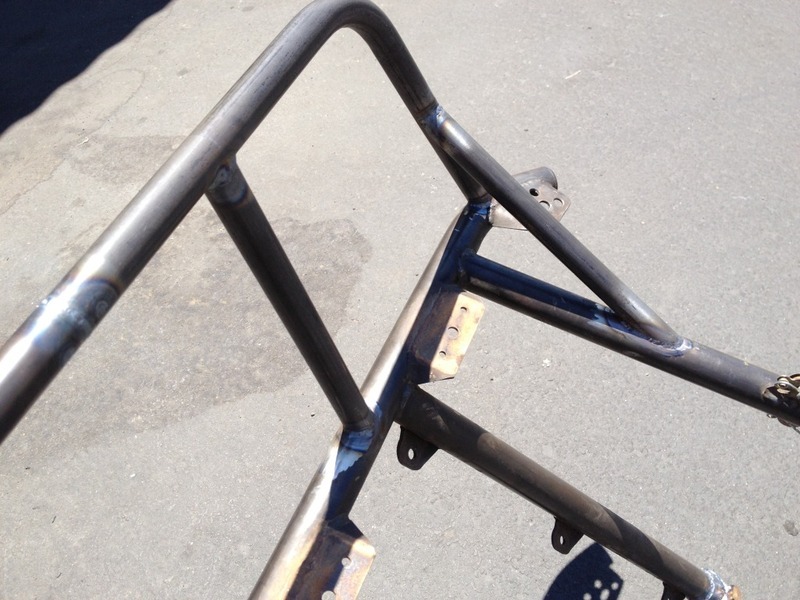 All fitted up and ready to weld. Memphis for training, so the updates will be a little delayed. Tacking the new roof in place. 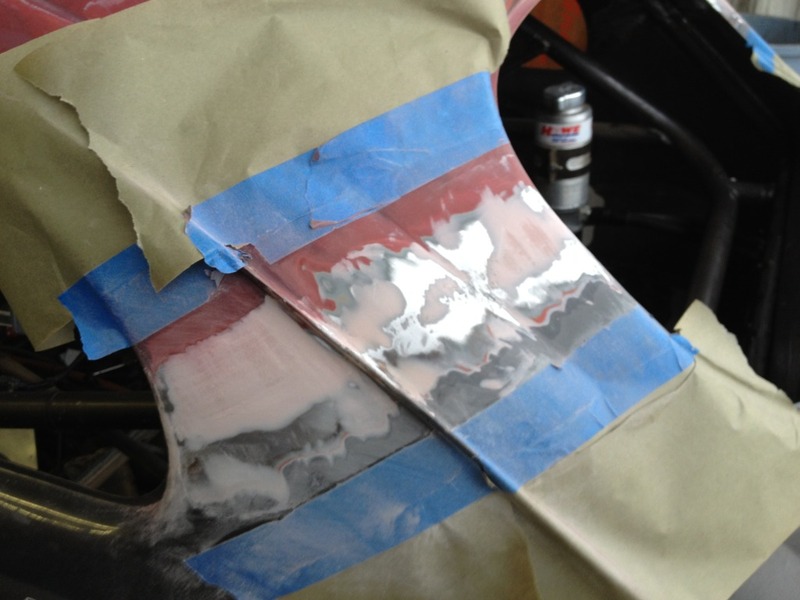 A little Bondo to smooth the joint. Trim holes welded closed on new doors. Front bumper light guard repaired. 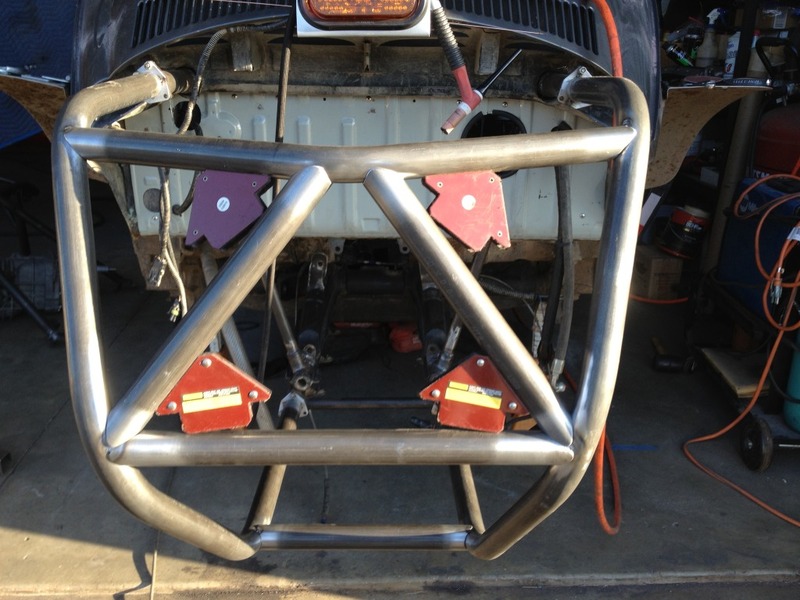 Front bumper ready to bolt up. large. The backing pieces are inside the pillars and not visible. 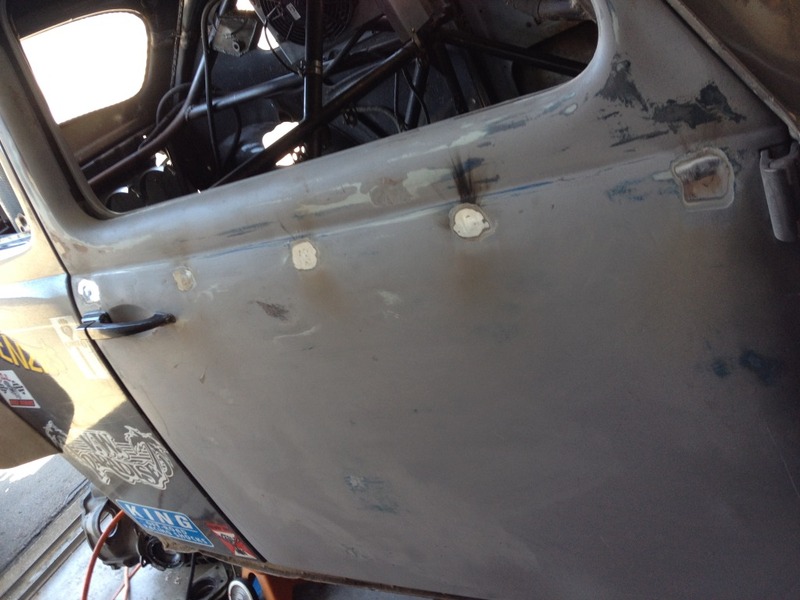 for the plumbing to pass through, replacing the fuel filler window mount tabs, etc. 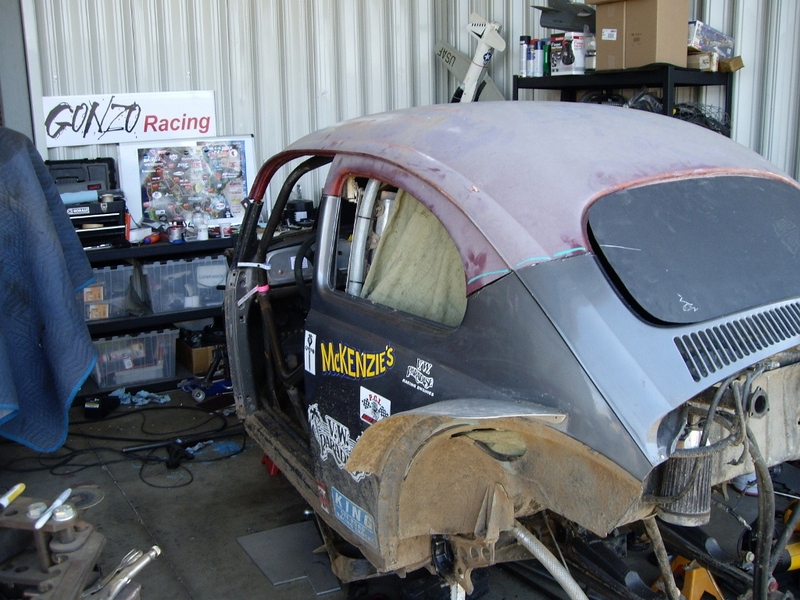 all the set-up work and the car is basically ready to be reassembled and tested. install it so that it's removable for future maintenance once the trans "hanger mount"
to the rear cage for that repair. 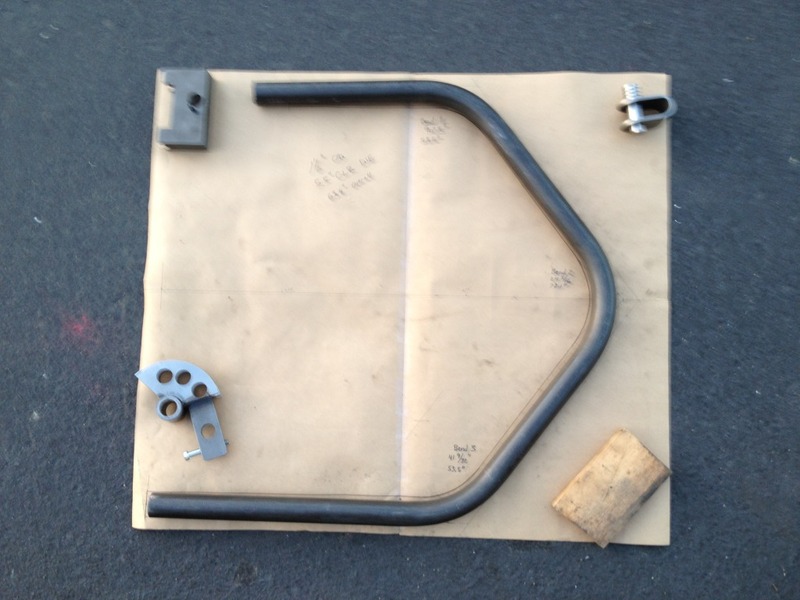 We hope to complete the hanger mount repair tomorrow. we weld the new roof on; that's our main objective when I get home on Tuesday. inches of "up" travel. Trevor sends me photos regularly to keep me "in the loop". 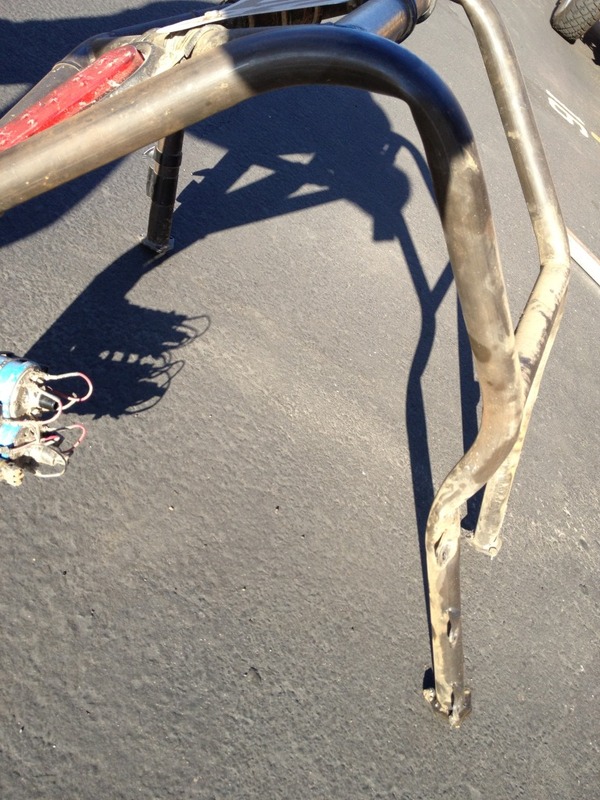 little torn up by the excessive axle angles. Hopefully, no broken or cracked CV's! that we fitted the roof to accommodate "standard" doors - not just the "tweaked"
of place; the roof now fits without having to apply pressure to any of the pillars. ready to mount. We didn't make it down to the shop today, all the driving wore us out! 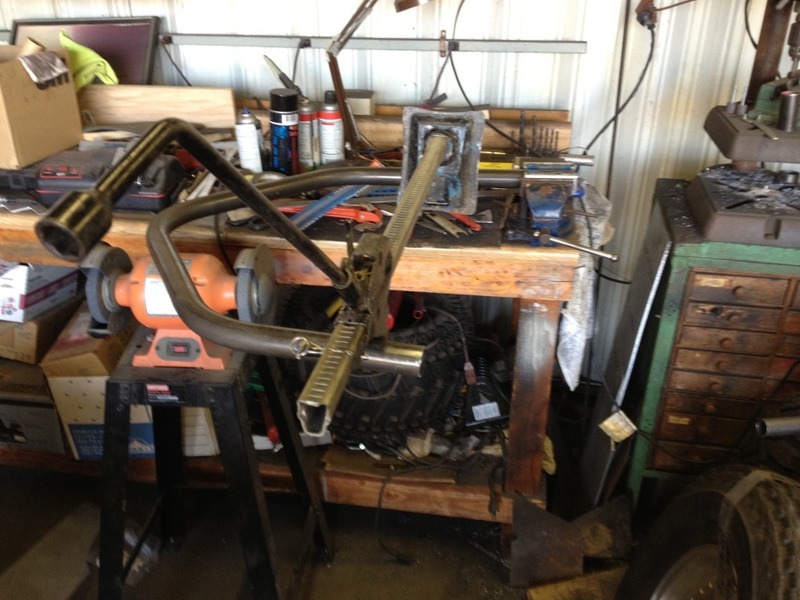 Trevor worked on fitting the new roof today and I worked on the front suspension. them to the shop and install them; then we can complete the final fitting of the roof. 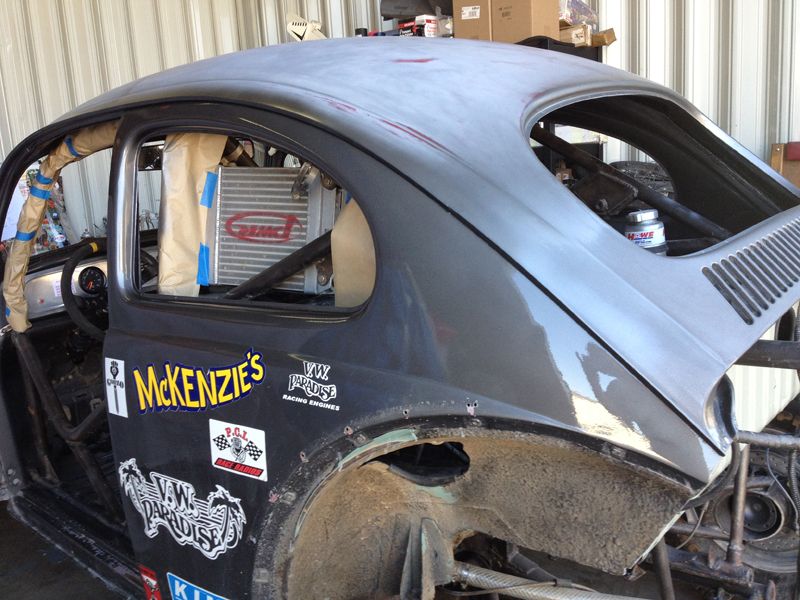 we made some window templates to help us fit the new roof section on the car. 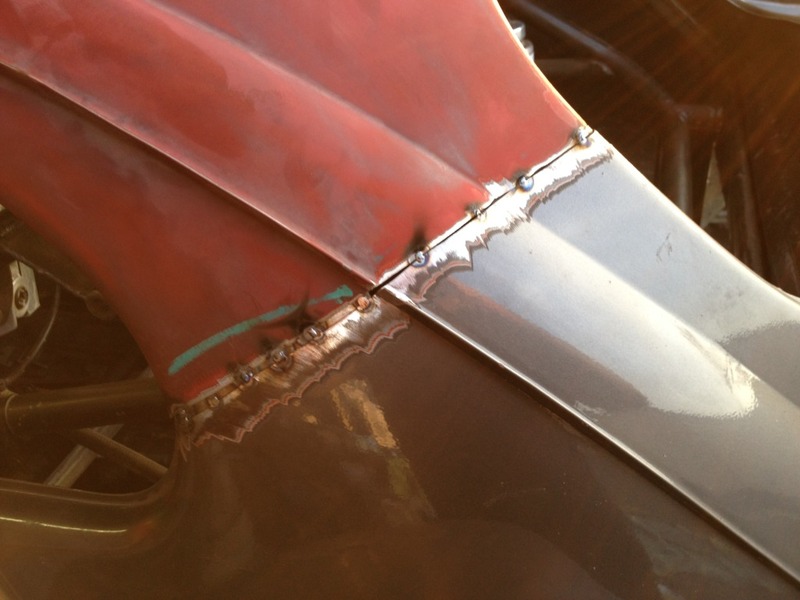 cuts left us plenty of material to fine tune the fit) and then broke out the SawsAll. have a couple of door options available, still trying to find the best compromise. 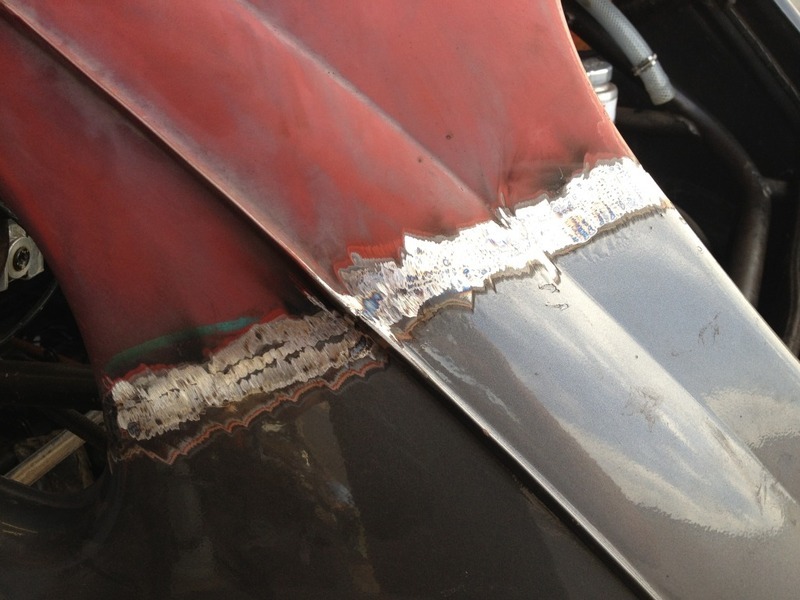 we'll final weld the new roof and begin the process of body work and paint. 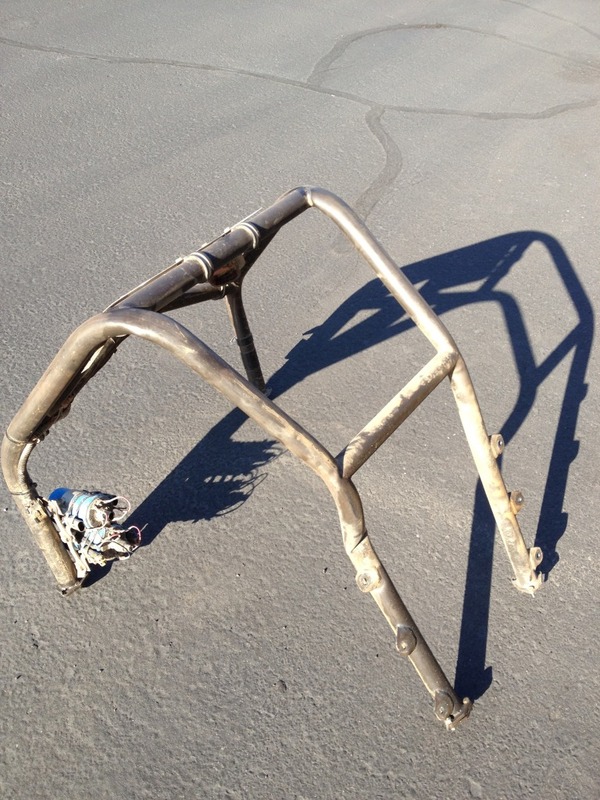 It's sure a lot easier to access the rear cage now! I'm finally home after 8 days in Dayton and can get back to work on the car. leave town again next week. 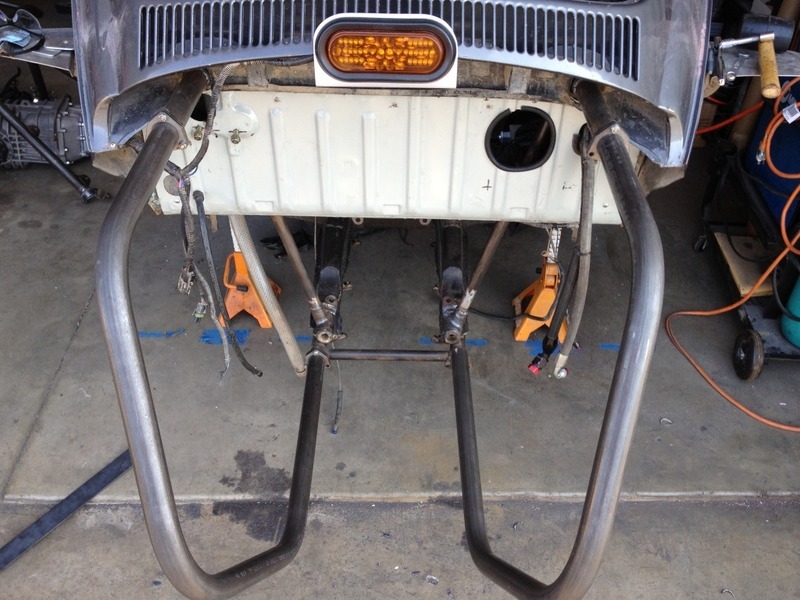 Trevor has the entire front end repaired and ready for new suspension components. a "normal" race prep effort. 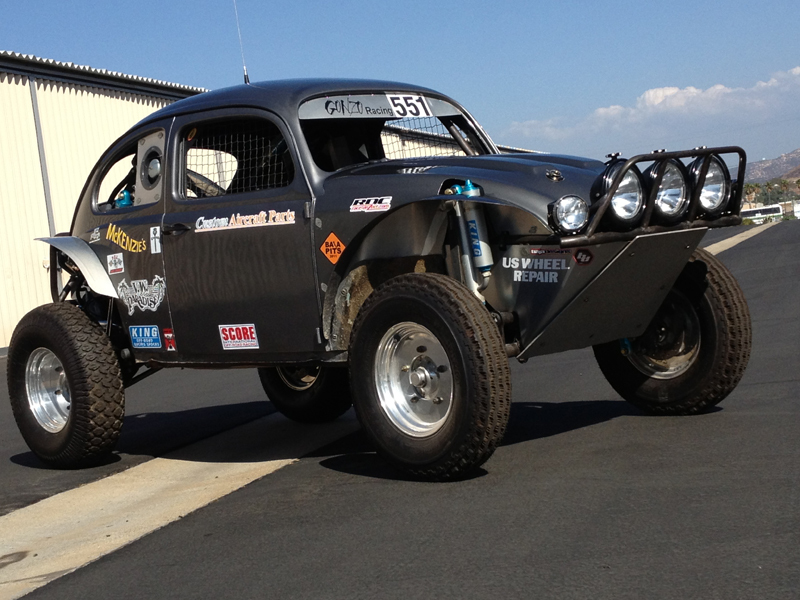 I think we'll be able to make the Baja 1000 this year! 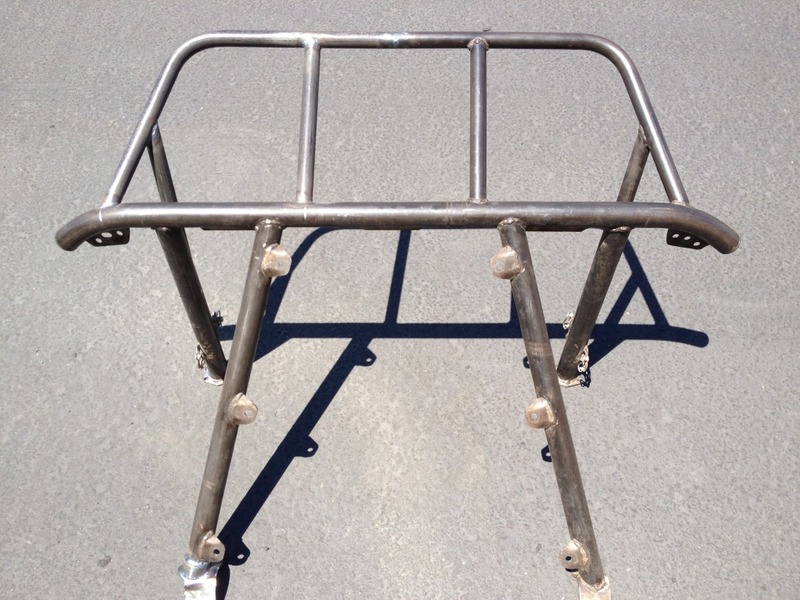 have the tubing on hand and now need to bend and fit the replacement sections. to a VW 091 type bell housing and the mount arrangement is a little different). 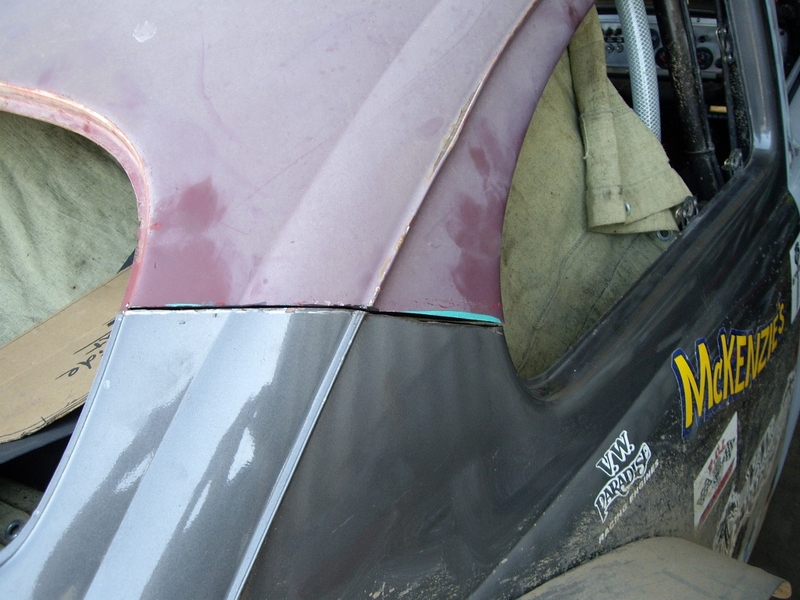 Once the structural problems are repaired, we can then start on the "body work". most of the structural problems handled by then. 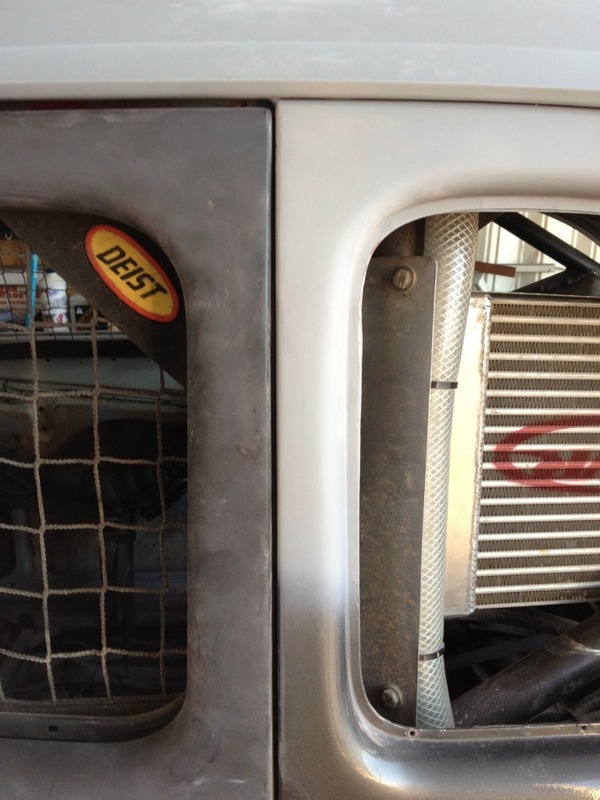 that we can make it to the Baja 1000 this year if we hit it hard this summer! 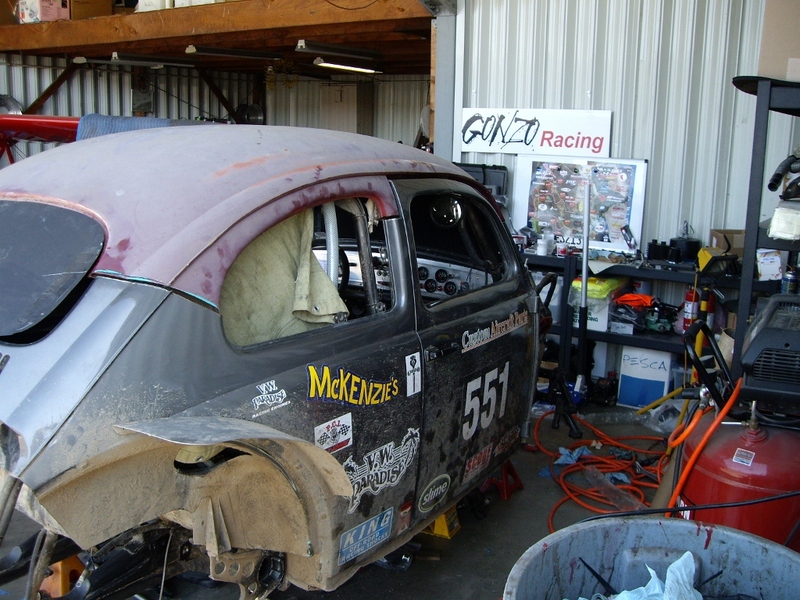 We're home from the 2012 Baja 500 where we had a very short but eventful race. 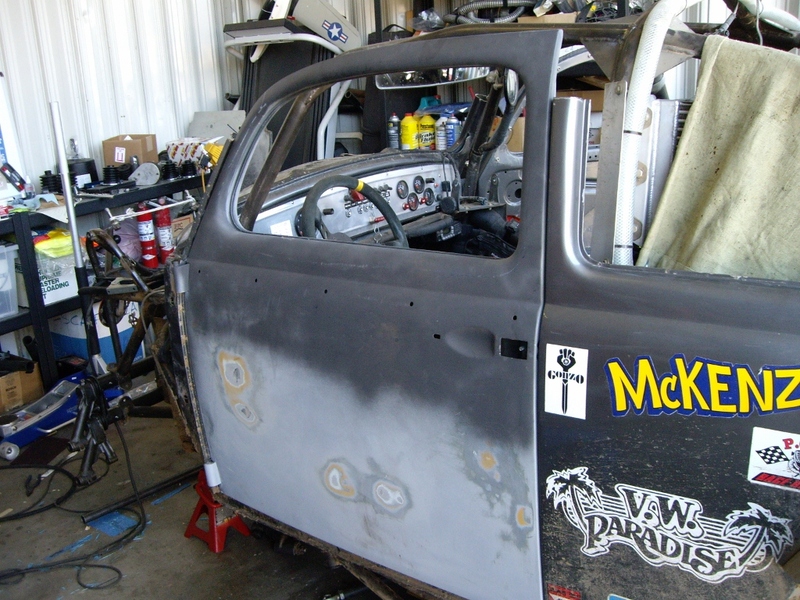 repair the rollover damage and hopefully have the car ready for the 2012 Baja 1000! We just got back from tech inspection, the car is as ready to go as we can make it! normal parade of dignitaries and maybe a little review of course problem areas. Thursday and Friday just before the race, so this is our first opportunity to see it. IRC to get our tracker..... Busy day. 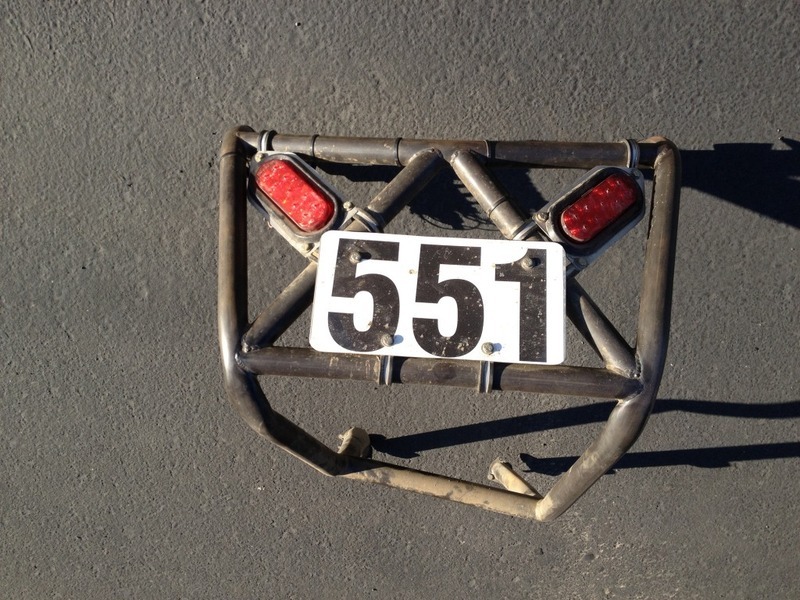 Trevor has been out pre-running the Baja 500 course from RM 40 to RM 260 today. Tomorrow he will be pre-running the second half of the course, RM 260 to RM 408.
race early in the week. Friday afternoon; the first thing I did when I got home from a week long trip to Denver. 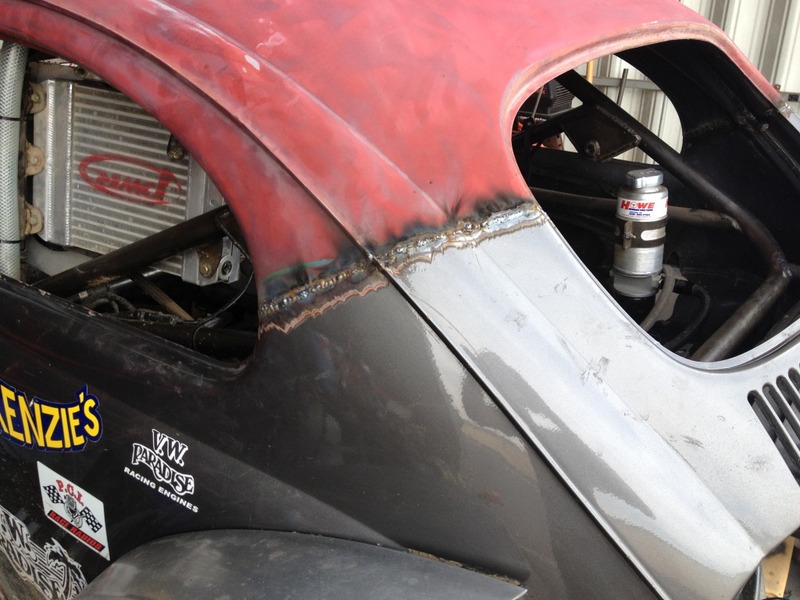 we bolt it up to the car..... Just what I needed - more time pressure! Rick St. John and KIT Racing for allowing Trevor to join their pre-running effort! down for inspection; it makes no sense to us to re-use a part that's obviously not 100%. released so we can plan our pit/fuel/chase strategy. 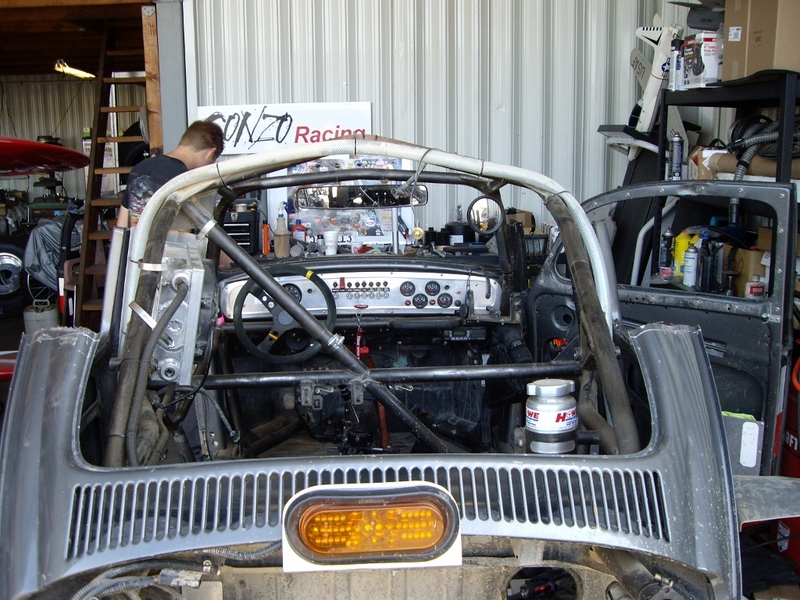 the engine and a rear bumper/cage. One more day's work 'till the car is ready to race! 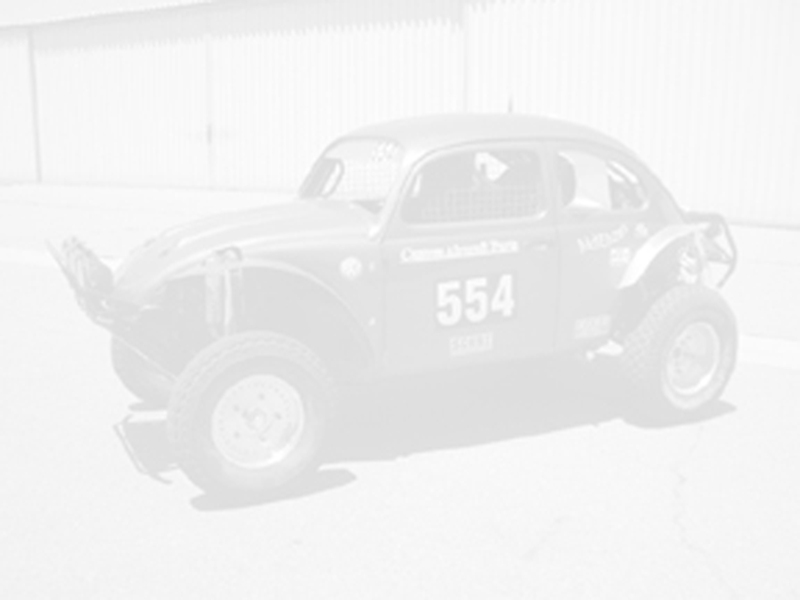 I faxed in our Baja 500 Entry Form this evening, and we have our hotel room booked. our trailer, the electric brakes aren't working like they should. It's always something! 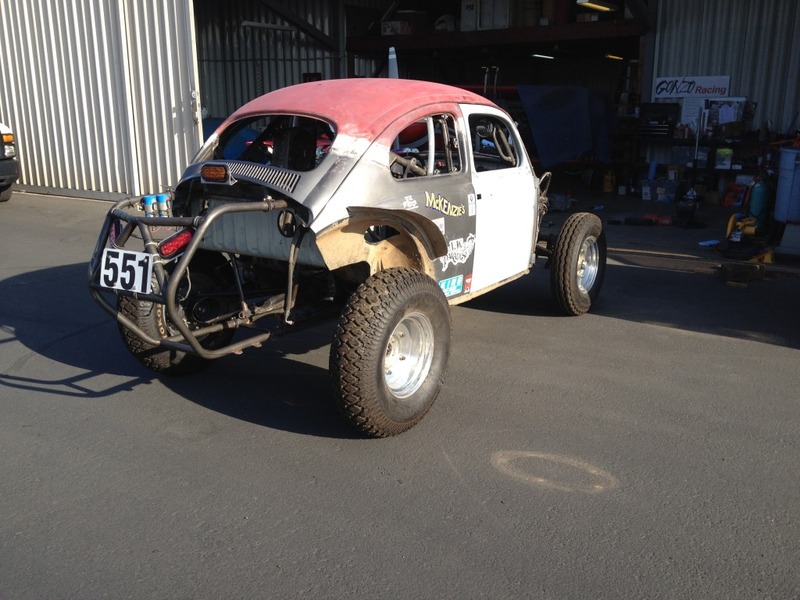 car to the Baja 500 without doing all we can to ensure we get to the finish line. 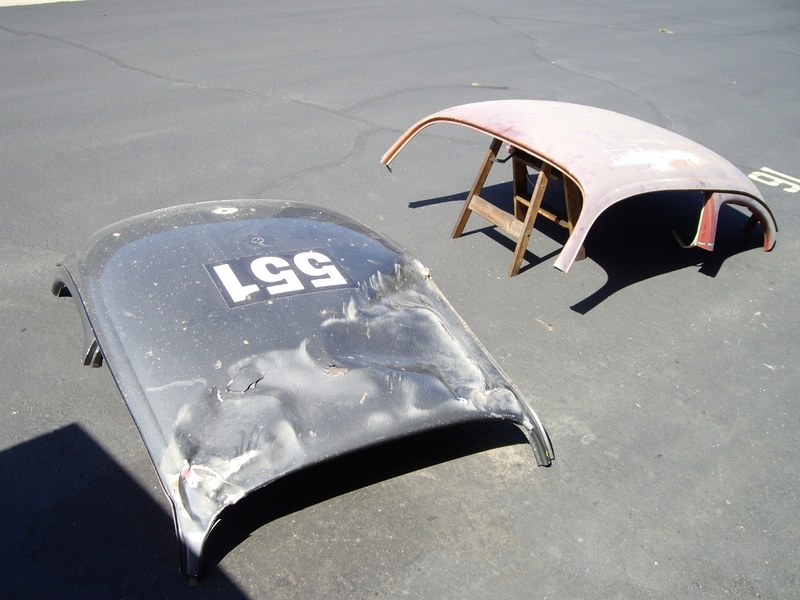 getting parts back from inspection/overhaul, we will begin reassembly. 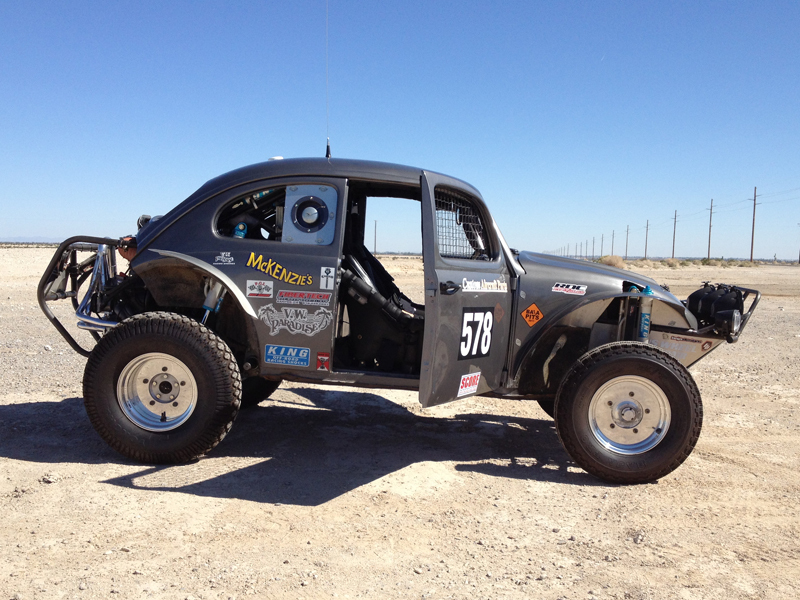 We're back from San Felipe and starting on the video and photo editing for the website. 182 - costing us the lead and placing us in 3rd at the finish line. That's racing! head out. We're excited to race again! after 8 months off from racing! Next stop, San Felipe! chase crews, co-drivers, test/tune session, final prep., SCORE memberships, etc..
Fortunately, I have a few days at home for a change! really need to get some time on the engine/car before then!